Help me Captain, those damn ducks are everywhere, is there a cure? LOL - glad to see the ducks are working for you! Stop-losses, targets etc - this is where you make the system your own, all depends what type of a trader you are - day - swing - positional YOU DECIDE! Great trading - solid as a rock! A set-up on the Ducks worth looking at? Where did Captain Currency go? Look how clean and clear the Aussie been!! Thanks for the system Captain I’ve truly been enjoying it. 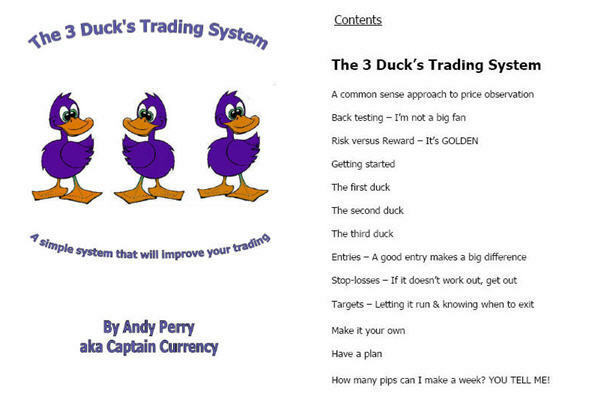 Glad you are enjoying the 3 Ducks and hopefully you are making some profits from it too! The bird flu virus found at a poultry farm is the deadly H5N1 strain, U.K. officials confirmed today. The source of the infection at the farm, home to 5,000 turkeys, more than 1,000 ducks :eek: and almost 500 geese, is under investigation, the Department for Environment Food and Rural Affairs said today at a press conference broadcast on the BBC. I’m an extreme novice to 4X and just getting ready to move into the market with real dollars in Jan. Anyway I’ve been following James IB system and trying to "play trade " it “by the book” for a few months. So I stumbled on to something that must have a correlation to the three ducks. Maybe the coincidence is price action a la Tess. Here’s what I noticed. When using three time frames 1 Hr., 15m., 5m., I’ve taken to waiting for the Stochs ( Slow 8.3) on all three charts to synchronize . In other words I wait for the stochs to all go into over bought territory and crest together on a sell and for all three to enter oversold and turn upward on a buy. Then I look for the rest of James signs to enter. However I did have good luck trading these indicators off of big numbers with the trend. Now these technical indicators are pretty much just abstractions to me, so maybe this would be an obvious observation to an experienced technical trader. It seems to have a higher possibility of success than other things I’ve been doing such as trading the Stoch “hook” on a shorter frame. Can anyone verify what this means?? 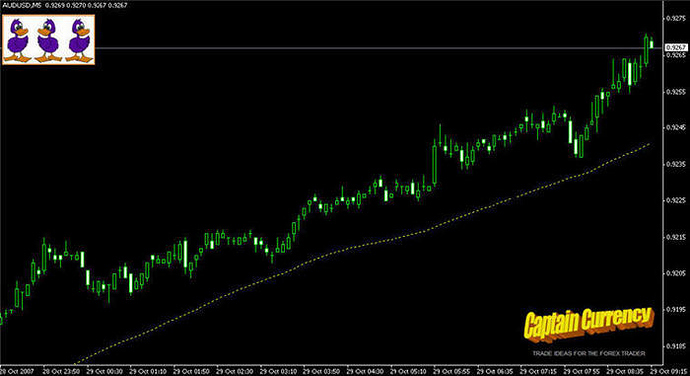 I’ve just closed my last trade for 2007 and it has made me 50 pips for a 20 pip risk. It was a 3 Duck’s Trading System setup. All my Ducks where lined up in the same direction so I was only interested in buying EUR.USD this morning, a break of yesterdays high seemed like a good spot to get involved and the round number at 1.4700 seemed like an obvious target. 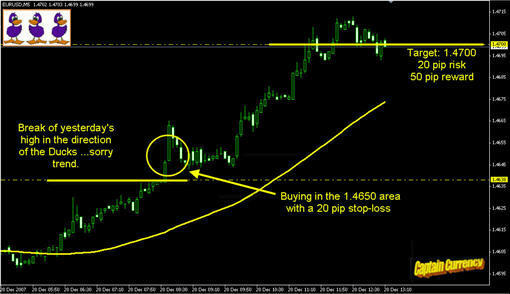 The position never really got into trouble and my fixed 20 pip stop-loss did the trick! 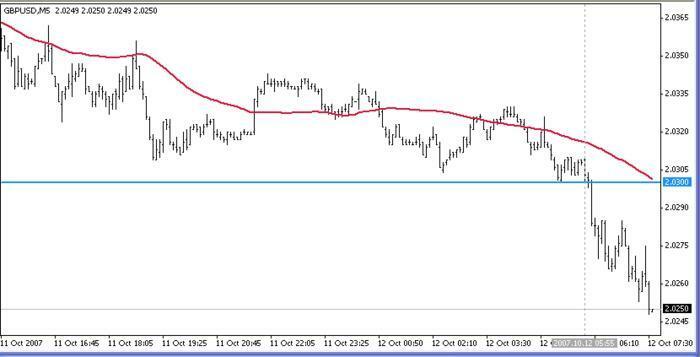 Another currency pair that is obeying The 3 Duck’s rules is the AUD.USD. All your ducks where lined up this morning on the Aussie for a BUY. I have been back testing it and it seems to show good profit and simple to use. 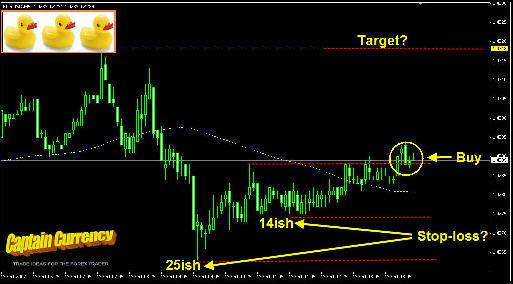 I dont want to have to check trades all day long so i am trying it on longer time frame. Have you experimented with longer time frames. Good job and thankyou Captain. I will keep post as I try new things and find out the results. it seems to be a good solid strategy. im testing it out and trying different time frames and stop losses. I am looking for more input to keep your strategy going. Seems simple and a winning strategy. all candles were above the 60 sma and 30 sma on all time periods from monthly to 5 minute and PSAR indicator was also showing all buy signals on every time period. So i will just have to wait and see what happens.